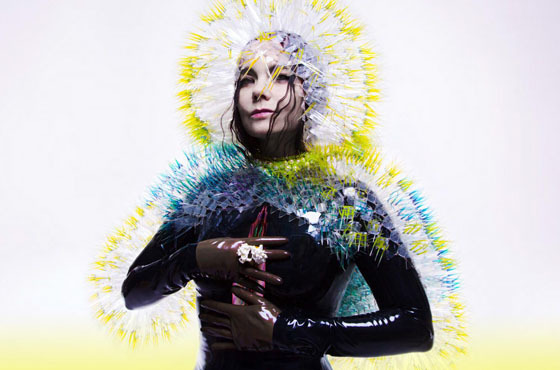 Icelandic pop wizard Björk continued the live support of her latest LP Vulnicura the other night (March 25) at New York's City Centre, and a recording of the full performance has now surfaced online. She was joined on stage by producer Arca, percussionist Manu Delago and 15-piece orchestra Alarm Will Sound, as she delivered two sets of material. The first set heard the first six tracks of Vulnicura in their album sequence, while the second set dipped into the singer's back catalogue before closing with another pair of the new tunes. The audience was treated to two encores, featuring "Sun in My Mouth," and then the final closer, "Wanderlust" from Volta. The entire performance was recorded by NYCTaper and is available for download here, with a disclaimer assuring listeners that the set is "posted in accordance with Björk's long-standing policy on fan recordings." You can see the full setlist below. Vulnicura is available now via One Little Indian/Sony.